Hippotherapy is highly effective treatment strategy used by specially trained Physical, Occupational and Speech Therapists. At Carlisle Academy our Physical and Occupational Therapists are board certified through the American Hippotherapy Certification Board and represent three out of approximately 100 credentialed therapists worldwide. In contrast to therapeutic or adaptive riding, we offer clinical-based occupational or physical therapy programs delivered by health professionals who have advanced knowledge in how equine systems impact human systems. 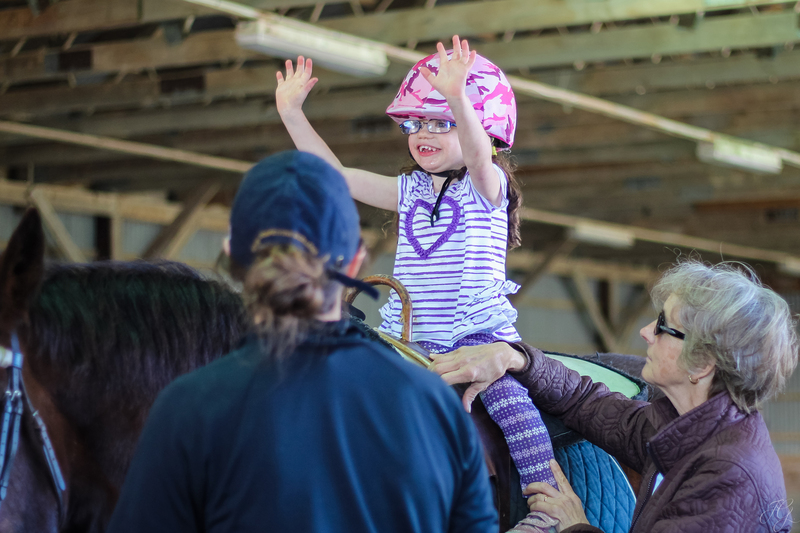 Therapeutic or adaptive riding is an adaptive recreational program delivered by therapeutic riding instructors with goals that are based on a progression of riding skills, not clinical outcomes. Why is this strategy so effective? Soon after birth, our brains develop from a low to high and front to back progression. Research has demonstrated that our brain’s ability to adapt and respond to the challenges related to trauma, disease, aging or developmental conditions exists throughout our life span. The process of brain growth and adaptability is called neural plasticity. With trauma, the brain can re-route around brain damage and form pathways that compensate for damaged tissue. In children, neural plasticity is at peak immediately after birth through 6 years old (hence the importance of early intervention) and continues but narrows as the child ages. Some developmental conditions, like autism, do not follow typical patterns of neural plasticity and, as a result, the child can experience both over and under neural connectivity in different parts of the brain. In addition, research shows that our brains assimilate new information faster when the task is play-based and meaningful. Within the context of our treatment at Carlisle Academy, hippotherapy patients are engaged in a meaningful, fun activity and are unaware of the adaptive responses going in their bodies and brains. The concept of human to animal bonding has an enormous impact our Occupational and Physical Therapy programs and this correlates directly to our patient outcomes. In addition to forming affirmative bonds with our equine partners, during treatment we adjust the horse’s gait, rider position and movement patterns of the horse, providing each patient with remarkable sensory and motor experiences. As sensory-motor activity is the basis of neural plasticity, we see a profound impact in neurodevelopment and recovery week after week. With advanced knowledge of just how equine systems impact human systems, Carlisle Academy therapists are experts in developing exceptional equine-based therapy programs. Click here for information on hippotherapy clinical research. Compare Hippotherapy to Adaptive Riding or Carriage Driving here. For an informative piece on hippotherapy as an effective treatment strategy, view American Association of Hippotherapy’s position statement AHA Position Statement.